We're pleased to announce the launch of the new custom website for the Inn at the Convention Center. 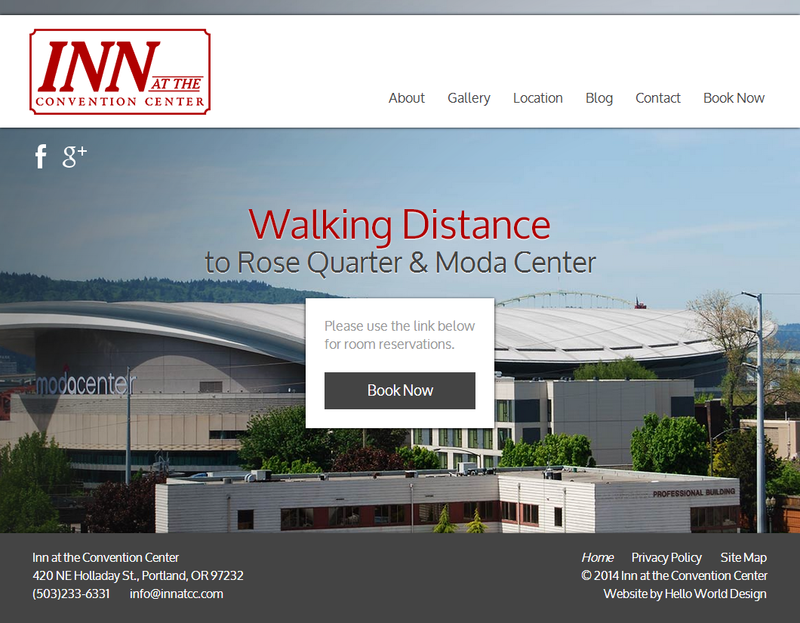 Located in Portland, Ore., the Inn at the Convention Center is convenient walking distance to such attractions as the Oregon Convention Center, the Rose Quarter, including the Moda Center and Veterans Memorial Coliseum, and the Lloyd Center mall, among other Portland attractions. The hotel is also situated by both the MAX light rail system and the Eastside Street Car, making it incredible easy to travel around the city of Portland. The Inn at the Convention Center is a five-story, 97 room hotel with meeting rooms and a range of premium guest amenities available, including a wet bar, refrigerator, microwave and guest laundry services. Guest rooms are pet friendly and come standard with amenities such as free high speed wireless Internet access, coffee/tea maker and 25-inch cable television. Hello World Design created innatcc.com to be fully responsive, so it easier than ever to get hotel information through both the Web and mobile site. The new Inn at the Convention Center site has a clean, streamlined design and also includes helpful features like online booking, a picture gallery of hotel, a list of Portland attractions and a blog for hotel news and announcements. Explore innatcc.com and see the Inn at the Convention Center's new look for yourself.